For more than 25 years, Gooseberry Patch has been your source for homestyle cooking. 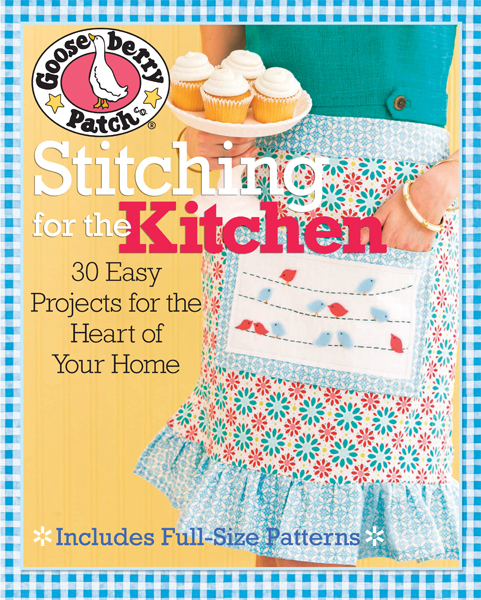 Now, with a collection of 30 beautiful sewing projects, Gooseberry Patch will inspire your creativity in your kitchen! Thirty projects from bestselling cookbook brand Gooseberry Patch! Using sewing, patchwork, and embroidery, create special touches for the home and hearth. Stitch up aprons, casserole covers, teapot and mug cozies, potholders, trivets and hot pads, kitchen organizers, tablecloths, napkins, runners, and more. This book will delight stitchers at all levels of skill and experience. As a bonus, the book features delicious Gooseberry Patch recipes, charming artwork, and two 28" x 40" pattern sheets.